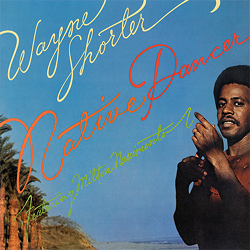 For the present LP Wayne Shorter took a chance with five compositions by Milton Nascimento, wrote three pieces himself, and one was contributed by Herbie Hancock. Apart from Herbie Hancock and Airto Moreira, the musicians were relatively unknown, yet they were all capable of integrating themselves and making a personal contribution. What is truly fascinating in this music is the beauty of the themes, and the affinity to Brazilian folk music. In the liner notes, Wayne Shorter emphasizes the authenticity and the seriousness with which the studio was filled during the recording session. This is absolutely palpable and audible in every second of the music – even after almost half a century. What better reason for including "Native Dancer" in your collection, alongside "Speak No Evil" and "Supernova". And by the way, with Wayne Shorter you can’t go wrong; you can buy his records without any ifs and buts.